I have always been fascinated by the role and impact science has in society. I grew up wanting to be an astronaut, in lieu of this I studied physics. For more than 20 years I worked as a research scientist in both academia (RMIT University & Salford University) and industry (Amcor Research & Technology Centre). Currently, I am researching and writing a biography of the positron and its antimatter siblings. I addition I work in the Research, Innovation & Commercialisation group at The University of Melbourne. As well as holding an ARC Queen Elizabeth II Fellow, I held fellowships and grants from the UK Ministry of Defense (Royal Signals & Radar Establishment, Malvern), the UK Science and Engineering Research Council and the Australian Research Council. I have also worked in corporate, strategy, marketing and consulting roles. 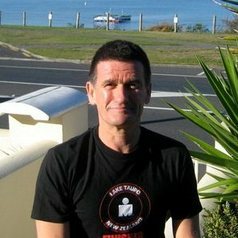 A retired triathlete I have been known to race and enjoy the occasional ultra trail-run.